INDIANAPOLIS – A former Indiana governor has become vice president of the United States. He sits on the precipice of power as the world awaits the fate of the president. He is, literally, a heartbeat away. That’s where America stood almost a century ago in 1919. President Woodrow Wilson had suffered a minor stroke in September and then a more severe one on Oct. 2, leaving him partially paralyzed and incapacitated. The former Hoosier governor was Vice President Thomas Riley Marshall of Columbia City, urged by some to assume acting presidential powers and duties, though top Wilson aide Joseph Tumulty and First Lady Edith Wilson prevented Marshall from taking control. The pair, who viewed Marshall as having an “uncouth disposition,” never notified the cabinet or Marshall of the president’s dire condition. There was no 25th Amendment (it was adopted many decades later) allowing a cabinet and vice president to act if a president were to be incapacitated or mentally unfit to serve. Today, it is Vice President Mike Pence who is the proverbial heartbeat away. The former Indiana governor serves at the right hand of President Donald J. Trump, the oldest president ever elected and one hounded by scandal. Perhaps the biggest parlor game in Washington these days is this question: What are the chances that Michael Richard Pence of Columbus, Indiana, becomes the 46th president before 2019 rolls into 2020? Thus, we find Vice President Pence at a crossroads. Unlike Marshall, Pence appears to be on good terms with President Trump and the Trump/Kushner clan that runs the West Wing. Pence is a frequent presence in the Oval Office and travels routinely with Trump to rallies and summits. The two have lunch almost every week (Monday’s was the only thing on Trump’s official schedule this week). Was it a joke? Was Trump just goading his tormenting press corps? Only one man knows, or, perhaps, he really doesn’t. On Nov. 16, the New York Times reported that President Trump questioned Pence’s loyalty: “In one conversation after another he has asked aides and advisers a pointed question: Is Mike Pence loyal? Mr. Trump has repeated the question so many times that he has alarmed some of his advisers. The president has not openly suggested dropping Mr. Pence from the ticket and picking another running mate, but the advisers say those kinds of questions usually indicate that he has grown irritated with someone… But some Trump advisers, primarily outside the White House, have suggested to him that while Mr. Pence remains loyal, he may have used up his utility. These advisers argue that Mr. Trump has forged his own relationship with evangelical voters, and that what he might benefit from more is a running mate who could help him with female voters, who disapprove of him in large numbers.” The name that often surfaces is former United Nations ambassador and South Carolina governor Nikki Haley. That Nick Ayers turned down becoming Trump’s chief of staff in December to return to Georgia was revealing. It underscored some of the speculation on Kelly’s reservations about Pence, but Kelly is now gone. HPI’s take at the time was that as Trump heads into a tumultuous 2019 and challenging reelection cycle, Ayers decided his future is really with Pence. Should Mueller’s report be so damning that Trump’s political support within the Republican Party collapses – the most likely end to a Trump presidency, not impeachment – Ayers could return to serve a President Pence. The tumult at hand and still reverberating is the 35-day government shutdown that stiffed 800,000 federal workers (and 20,000 Hoosiers) two paychecks, and came close to throwing the nation’s aviation grid into dangerous turmoil. Its end coincides with Special Counsel Robert Mueller tightening the noose around Trump’s campaign inner circle; chairman Paul Manafort, deputy Rick Gates and now confidante Roger Stone have all been indicted. Strokes and God determined the fate of President Wilson. With Trump, it could be Mueller and Senate Majority Leader Mitch McConnell. In 1974, it was a Supreme Court ruling on the Watergate tapes which revealed President Nixon’s lies that prompted GOP support to collapse as impeachment loomed. Across Washington, Pence is largely viewed with high esteem among congressional Republicans and as more trustworthy by Democrats. He is seen as more predictable, more likely to stay within the guardrails than the petulant Trump. But being President Trump’s vice president hasn’t been easy. From Mike Pence’s perspective, Trump’s offer in July 2016 to join the ticket was a political lifeline. Pence’s own presidential ambitions were derailed in 2015 with the RFRA controversy. In a looming rematch with Democrat John Gregg, many saw Pence as a distinct underdog. HPI’s Horse Race rated the Pence/Gregg rematch in the “Leans Democrat” category, but Pence could have pulled it out. What we do know is that Pence’s inner circle wasn’t so sure. When many Republicans couldn’t fathom joining Team Trump, Pence adroitly positioned himself for the national ticket, as Dan Quayle did in 1988. Team Pence made a conspicuous behind-the-scenes play for the nomination. It culminated in a jittery 36-hour period when Mike and Karen Pence flew to New Jersey after abandoning the gubernatorial nomination, while Trump flirted with picking New Jersey Gov. Chris Christie. Christie writes in his new book, “Let Me Finish,” that Trump called him after Pence’s audition at Westfield (and a fundraiser at the Columbia Club), asking him “Are you ready?” In the end, it was Manafort and the Trump/Kushner clan that prevailed for Pence, convincing Trump to stick with the Indiana governor. The gamble paid off with Pence performing strongly in the vice presidential debate and making the closing argument for the ticket after it nearly collapsed in the wake of the “Access Hollywood” tape. Pence beseeched skeptical Republicans to “come home,” and enough of them did to help forge the most epic presidential upset in history. Two days later, Jared Kushner and Steve Bannon convinced President-Elect Trump to jettison Christie as the head of the transition team. Vice President-Elect Pence was installed at its helm, and the very survival of the Trump presidency perhaps will be traced to that fateful decision. What ensued was the worst presidential transition in modern history. Christie writes in his new book, “Let Me Finish,” that his work for President Trump’s transition team ended up in the dumpster, literally: “The day after Trump was elected, he was handed a detailed road map that would have avoided many of these pitfalls and launched him on a far more promising path, a plan that was fully consistent with his values, his campaign promises, and his publicly stated views. But that plan was thrown in the trash. Literally. All 30 binders were tossed in a Trump Tower dumpster, never to be seen again. Steve Bannon, Rick Dearborn, Jared Kushner and others, for their own selfish reasons, got rid of the guidance that would have made their candidate an immensely more effective president and would have saved him an awful lot of heartache, too. In so doing, they stole from the man they’d just helped elect the launch he so richly deserved.” Christie has spared Pence, not mentioning him in that passage or Tuesday on MSNBC’s Morning Joe as he promoted his book. Looking back at all this through the prism of Special Counsel Mueller, it was the transition period that presaged the ominous trajectory of scandal Trump faces today: Michael Flynn’s meeting with the Russians, his past ties to Russian President Putin, his lies to Vice President Pence, the warnings from the FBI and the Department of Justice, Flynn’s abrupt dismissal in February, all leading to the May 2017 firing of FBI Director James Comey. From an Indiana perspective, the ascendance of Vice President Mike Pence has been a boon for the state. Former senator Dan Coats controls the Trump-tormented national intelligence community. Health and Human Services Sec. Alex Azar and Medicaid/Medicare Director Seema Verma control a vast amount of the federal purse; HHS is expected to spend $1.2 trillion in FY2019. According to the Center on Budget and Policy Priorities, Medicare, Medicaid, the Children’s Health Insurance Program (CHIP), and Affordable Care Act (ACA) marketplace subsidies accounted for a combined 26% of the federal budget in 2016, or $1 trillion. Pence was instrumental in bringing Coats, Azar, Verma and Surgeon General Jerome Adams to Washington to serve the Trump Administration. There have been no less than 25 other Hoosiers serving in various capacities in the Trump administration. Much Hoosier political talent has migrated into the Trump/Pence sphere. Indiana Republican Chairman Kyle Hupfer told HPI last year that this migration has opened a new strata of young talent within the Indiana GOP and the election results of 2018 bode well for the future. But, it remains unclear how hands-on Pence was during the transition. We have photos of him showing up at Trump Tower holding binders (presumably new, presumably with some of the aforementioned Hoosiers’ names). Multiple sources tell HPI that key Pence lieutenant and future chief of staff Josh Pitcock was a key transition operative. It was curious that Pitcock would exit the scene just six months into Pence’s vice presidency. Why would such a trusted, long-time aide leave just as the boss was nearing his pinnacle? Multiple sources tell HPI that Pitcock has been interviewed by the special counsel’s office. We know that Pence has lawyered up, but there is no reporting that Pence has met with Mueller’s team. Stone offered no reason that Pence would be charged, other than his theory. “There is no Russian collusion. I have no collaboration with WikiLeaks. I’m not charged with conspiracy. Believe me, if they could’ve made that case, they would’ve.” But Stone has been Trump’s own Gabriel, harkening strange and dark events. But all this access and proximity to power has come with a series of indignities. President Trump undercut Pence when he tried to negotiate during the government shutdown with Senate Minority Leader Chuck Schumer. When HPI analyzed U.S. Rep. Pence’s 12 years on Capitol Hill, we were struck by his lack of bipartisan relationships or legislation. Sen. Dan Quayle had teamed up on key workforce legislation with Sen. Ted Kennedy, and current U.S. Sen. Todd Young just had a bill signed into law with U.S. Sen. Elizabeth Warren. Pence had no similar relationships or record. Part of the rationale for Pence joining the ticket was his experience and relationships on Capitol Hill. But he has virtually none with Democrats and results are wanting. On the key Obamacare repeal vote in the summer of 2017, Pence failed to convince Sen. John McCain to support the administration, the late senator’s thumbs-down gesture on the Senate floor coming hours after Pence had tried to fashion a victory there. And on issues such as tariffs, where Republicans like U.S. Rep. Jackie Walorski have attempted to steer the administration into “scalpel” tariffs as opposed to the administration’s “shotgun” approach, there is little evidence that the former free-trade advocate Pence has tried, let alone succeeded, in recalibrating the president on economic moves that are wreaking havoc with U.S. and Indiana agriculture and manufacturing sectors. There are two schools of thought on Vice President Pence. One is that he is a trusted voice for Trump, advising him behind the scenes and is working, as one reliable source told HPI “to keep a lid on things.” We just don’t see that side of Pence and his team has cordoned off the media, even on background so we do understand. Congressional sources tell HPI that they view Pence as one of the “adults” who keeps Trump within the guardrails. The other school is that he is the classic lackey, sycophant, bootlicker and brown-noser. The public face is the loyal, praising partner, though Pence has stopped comparing the sunny, optimistic President Reagan with the dark, mercurial “I alone can fix it” President Trump. Vice presidents are there to support the president. Such is the indignity of service as vice president, aggravated by the peculiarities of our current president. Mike Pence set course on this path because he saw it as the best chance of a White House administration of his own. Yet, we know that for Hubert Humphrey, Bob Dole, Walter Mondale, Al Gore, and Dan Quayle, the office truly wasn’t worth a bucket of warm piss. All lost presidential races after making the ticket or serving as vice president. Vice President Nixon lost his 1960 race, but was able to bounce back eight years hence. Hossier Democratic boss Thomas Taggart nominated Marshall for president in 1920, but outside the Hoosier delegation, he mustered little support, giving way to the James Cox/FDR ticket. Only Presidents U.S. Grant, Warren Harding, Richard Nixon and Bill Clinton have faced the level of scandal that President Trump does today. None of them was dealing with it this early in their respective presidencies. Fate was cruel to Vice President Marshall, who after 1921 returned to Indiana and relative obscurity, practicing law in Indianapolis and died in 1925. Pence is one of the most conspicuous people in Washington. His first two years as vice president have brought controversy, even bedlam. And yet both Trump and Pence played an integral role in the defeat of U.S. Sen. Joe Donnelly and the ascension of Sen. Mike Braun last year, so there is still significant political clout. What does the future hold for Mike Pence? 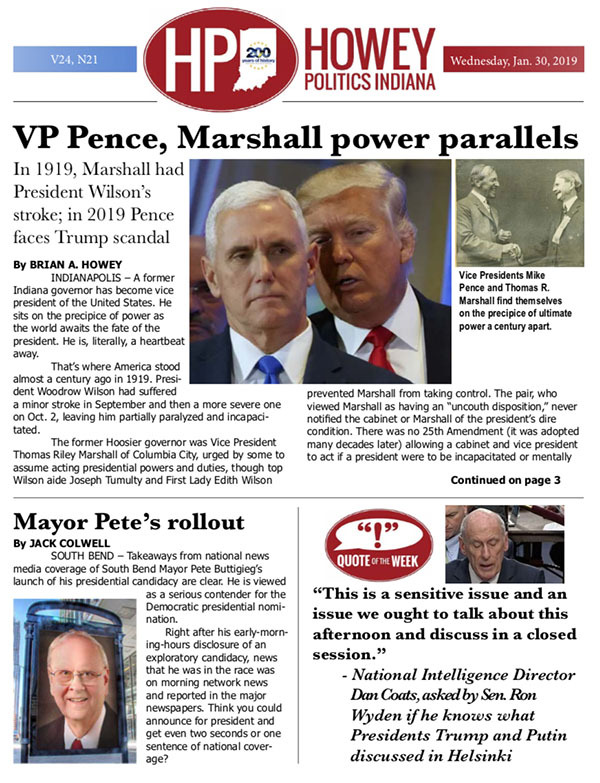 No one knows, but this much is clear: Only he and Vice President Marshall faced the scenarios now presenting themselves to the latest Indiana governor to find himself a heartbeat away.